Walt Hearn can justifiably be considered the godfather of God & Nature. When the founding editor, Emily Ruppel Herrington, contacted Walt for consultation, his enthusiastic encouragement, along with his ongoing advice and contributions, were essential to the success of the magazine. Emily and Walt formed a close-knit bond, with Walt’s blend of wit and keen-eyed criticisms providing the crucial support she needed to create a quality publication. Walt composed a regular “Beyond Science” column for God & Nature. Before his untimely death while still in his prime at the young age of 91 years, he wrote several columns in advance. In this particularly poignant piece, he talks frankly about his imminent passing to the realm beyond science. It is another treasure that Walt has given to those of us who will someday follow in his footsteps. I was expecting that “d.” to be added to my bio, but I didn't know when. For those of us with academic backgrounds, “passing” (like an exam, or a course) has a positive ring. Eventually we graduate and “enter the real world.” Passing is a significant milestone. In June 2015 I opened an “obituary” file after the only personal experience I'd call a miraculous healing. Ruling out one possible physical cause after another, I finally accepted it as a “sign,” a term used in the Gospels. The intense pain, which would have rendered me immobile, suddenly left my body after a night of fervent prayer. I awoke full of praise to the Great Physician (wondering what I'd say to our family doctor). The doctor shrugged, but had no suggestions of his own. Getting the observer's attention seems to have been the main point of Jesus' miracles. That flashing evidence of my fragility certainly got my attention. I began wondering what a whimsical piece about dying for God and Nature would look like. Eventually I submitted a “not-quite-final draft” to let the editors decide whether to publish it after my graduation. If you're reading this, they did. To keep this discussion lighthearted, you could think of me as having joined the “Dead Poets Society.” There was a movie with that title starring Robin Williams as an English teacher trying to interest his preppy students in literature. It occurred to me that the authors of most works we deem as classics, like those of Shakespeare and Darwin, died long before I encountered their works. Believers shouldn't be freaked out by dying. We've “bet our life” on Jesus. We can “bet our death” on Him, too. By the time you're reading this, I'll be way “beyond science.” I have no idea what that will actually feel like. In a “near-death” experience (from ventricular fibrillation) in 2010, I was “out” for nearly a week before regaining consciousness. I fought hard to regain my “before-death” lucidity, but I had been too sedated to retain any hint of “after-life.” Jesus often spoke of eternal life, but even after His Resurrection I don't recall him saying much about His personal experience of it. He must have wanted it to remain a mystery. I can already see one problem in trying to write this particular “Beyond Science” column. What tense is appropriate? As I write, my dying is in the future tense but will be past tense when you read this. According to the Bible, God goes to great lengths to balance law (read: justice, righteousness) and grace (read: forgiveness, mercy). Many people say they find it logically impossible to reconcile those two attributes, so they've given up believing that God exists at all. For Christians, God created the world out of love. That idea carries over into John 3:16: “For God so loved the world that he gave his only Son, so that everyone who believes in him may not perish but may have eternal life.” Praising the Creator of all good things doesn't keep us from praising Him as the Redeemer, who fixes things when they get broken. Believers want to see justice done, the guilty punished, evil atoned for. We count on God to “take care of business” in some ultimate way. Maybe everyone longs for things to “come out right,” but juxtaposition of that concept with the concept of forgiveness tends to make us all uncomfortable. The Bible treats heaven and hell as realities, generally in figurative language open to interpretation. Are they locations? States of consciousness? Conditions? Some folks look forward to joining an angelic choir, forever singing God's praise. Maybe so, but that's not very appealing to Christians like me, who couldn't carry a tune in a bucket. On the other hand, that choir may need an audience. Perishing without Christ disturbs us because the Bible refers to hell as a place of unending punishment. How could a loving God permit such a thing? How could inhabitants of heaven be fully comfortable knowing that God exercises judgment not only on the truly wicked but also on beloved friends and family members? A theologically savvy friend of mine sees biblical warrant for two other possibilities for the fate of those found wanting at the last judgment: 1) spiritual annihilation (like a spiritual “second death”), or 2) an ongoing opportunity for reconciliation. He leans toward universal reconciliation in some intermediate state. Long ago I quit trying to figure it all out, but I can see why a guy with an Ed.D. might picture God as Eternal Educator. After all, at one time I pictured God as Principal Investigator in some ultimate laboratory, later on as Editor-in-Chief of everything. For about 80 of my years I've been a follower of Jesus, and for something like 40 of them a research scientist. I've always tried to take an “evidence-based” position on God as well as on nature. The evidence of Jesus' life, as reported in the New Testament, plus lives I could see for myself, led me to give my life to Jesus as Savior and Lord. Not long after that, and through pretty much the same kind of process, I committed myself to the pursuit of scientific understanding. Dual citizenship gave me two loyalties, two languages, two ways of looking at most phenomena. To me, both have made sense. I spent years checking out the evidentiary basis of my two commitments. I've tried to spread that evidence around, to people influenced by science who see no reason to believe in God, and to people in churches who see no reason to take scientific findings seriously. Throughout, I've focused on being evidence that a scientist can think like a Christian and a Christian can think like a scientist. I admit that it takes practice to do both, and that scientific practice differs from Christian practice. At any rate, I've had a good run—and a lot of fun. Ginny vetoed this project (“Not funny!”),” but if you're reading it, her veto was overridden by the editors of God and Nature. Anything else by me will be posthumous—but not post-humorous, I hope. Walter R. Hearn grew up in Houston and majored in chemistry at Rice University. He received a Ph.D. in biochemistry at the University of Illinois in 1951. He spent 17 years on the biochemistry faculty at Iowa State University. His research interests included peptide chemistry, hypothalamic hormones, and bacterial pigment biosynthesis. For five years he was a Visiting Biologist to Colleges for the American Institute of Biological Sciences. He is a Fellow and Life Member of AAAS and an Emeritus member of the American Chemical Society. 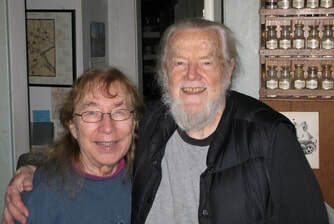 In 1972 he switched professions and moved to Berkeley to do free-lance editorial work with his wife Virginia. They have edited periodicals and some 200 books, largely for Christian publishers. Walt joined ASA while he was in grad school and served on the Council in the 1960s. From 1969 to 1993 he edited the ASA newsletter. He was a coauthor of the widely distributed publication, Teaching Science in a Climate of Controversy (ASA, 1986) and author of Being a Christian in Science (IVP, 1997). He has also contributed chapters to a number of books, the latest being "Creation Matters" in Darwin and the Bible: The Cultural Confrontation (Penguin Academic, 2009), edited by anthropologists Richard Robbins and Mark Cohen. His articles, reviews, and poems have appeared in such publications as Perspectives on Science & Christian Faith and the Berkeley publication Radix, for which Ginny has been copy editor for over 40 years.